Rodney Stark is a name I kept hearing being tossed around, both in print and in speech. Out of his many books, I settled on The Triumph of Christianity as an introduction to understanding his impact. Sociologist by profession, Stark seems to mainly focus on historical misperceptions and obfuscations regarding the influence of Christianity on the development of Western civilization. “History” is a funny thing. It is one’s perspective based on documentation (if it exists), evidence, human nature, and interpretation. There’s a lot of wriggle room there. Historical facts are fixed; getting to those facts is the trick. All historians view history through the lenses of their own experience with a little (or a lot) of bias thrown in. Neutrality is difficult, if not impossible. Stark is no exception. Still, it is refreshing when an author can offer credible analysis for his theories and is willing to question long held assumptions. I’ll mention a few that stood out to me. Mentioning one does not mean I fully agree with it or endorse it. But I am allowing them to challenge my own historical perceptions. The Christian message certainly appealed to Roman slaves and to the underprivileged. It brought all classes into fellowship–even friendship–with one another. This was an unheard of phenomenon. The New Testament contains numerous references to this reality. Stark contends a primary sociological reason that Christianity spread so rapidly was because members of the privileged classes embraced it. This was not only true for the first and second century church, but observed in the 16th-century Reformation movements as well. The mainline view is that Constantine adopted Christianity as Rome’s state religion in 313 AD. Persecution against Christians decreased dramatically. With its new government sanctioned status, the church turned fiercely upon its pagan neighbors. Yes and no, says Stark. What Constantine actually did was to include Christianity in the list of acceptable religions. He made it “respectable.” As a result, the ranks of the clergy swelled. Lack of persecution and an easy-living created a lax and lazy leadership. The emperor then turned his attention toward supporting heresy hunts. “Heresy” was broadly defined and included pretty much any viewpoint that didn’t garner official church approval. So instead of persecuting pagans, the church spent time and energy going after sects. If anything, Constantine’s legacy was that he took a robust and steadfast minority faith, endorsed it, and let it loose upon itself. This is one of Stark’s more controversial assertions. It has become accepted in academic circles and parroted by pundits that modern radical Islamic terrorism is, in part, a response to the crusading Europeans of the eleventh and twelfth centuries. Voltaire, Hume and Diderot all helped to shape this narrative. Edward Gibbon probably originated it. …a group of distinguished contemporary historians…propose that the Crusades were precipitated by Islamic provocations, by many centuries of bloody attempts to colonize the West, and by sudden attacks on Christian pilgrims and holy places. Self-preservation and the Pope’s promise of absolution seem to have been the actual motives for the Crusaders. The European knights were a bloodthirsty folk, yes. But so were their Islamic foes. It was, quite simply, a bloody age. There was not yet the renewed interest in Greek and Latin. But literary interests aside, without Rome’s tax burdens, “human effort and ingenuity turned to better ways to farm, to sail, to transport goods, to conduct business, to build churches, to make war, to educate, and even to play music.” In fact, the primary revolution, claims Stark, was not literary, but scientific. The foundation of modern science is the scientific method. The expectation for consistent results when testing a hypothesis is based on observable laws. Hence, the grand assumption of science as we know it today is that there is a natural law Giver. Actually, the statistics show the opposite. Stark closes with the evidence of this. (See also Next Christendom by Philip Jenkins) He demonstrates that though Christianity might be on the decline in Western Europe, it is on the rise in many other parts of the world (like Africa and Latin America). Whether you agree or disagree with Stark’s conclusions, his views are certainly worth considering. 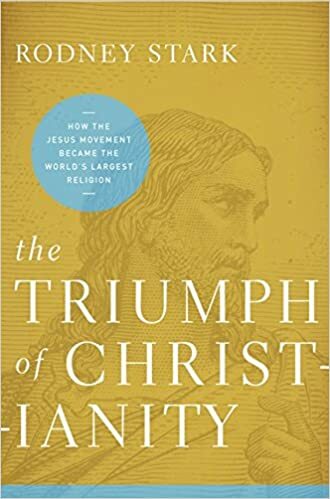 As a Christian, I ultimately credit the “triumph of Christianity” to God’s work in history. But underlying spiritual reality is commonly displayed through the “natural” progression of events. Here in is the value of Stark’s contribution: he capably applies social analysis to historical trends.